Homeschool unit on stars includes Bible, language arts, history, science, art, and music. This is written for children who are preschool through third grade. There are so many verses that talk about stars and the heavens. When I looked in the New American Standard Exhaustive Concordance I found 67 verses that had either the word star or stars in the verse. There are a lot of other verses that deal with heaven. Genesis 1:16 God created stars on the 4th day of creation. Genesis 26:4 I will make your descendents multiply as the stars of heaven. Job 38:31-33 Job mentions several constellations. Mathew 2:2 - 10 the wise men followed a star to find Jesus. You can also study verses that deal with heaven. One of my favorite verses is, the heavens declare the glory of God Psalms 19:1. Your homeschool unit on stars should include some poetry. There are several poems written about stars. Some are nursery rhymes such as Twinkle, Twinkle Little Star and Star Light, Star Bright. Twinkle, Twinkle Little Star comes from the poem The Star by Jane Tayor. Edgar Allan Poe, Robert Frost, and other great poets have written poems about stars. After you have read some poems have your child try to write a poem about stars. Cinquains and Haiku are usually easy for children to write. Pre-readers can find words that rhyme with star or words that rhyme with sun. Older children can research and write a report about the names of constellations. For history your child can study about navigation. Teach your child about the sextant and how sea captains used it to sail ships. There are several books about the American folk song Follow the Drinking Gourd. Many are written in either picture book form or easy readers. There is a legend about Peg Leg Joe teaching the song to slaves. The song was to help the slaves find freedom by following the Big Dipper and the North Star. We have read The Drinking Gourd: A Story of the Underground Railroad (I Can Read Book 3) which is available through Amazon. A homeschool unit on stars would not be complete without observing the night sky. All you will need is a star map and a clear night. To see a lot of stars you will need to be where there is not a lot of a light. City lights make viewing the stars difficult. Here are some facts about stars. Stars are made up of burning gasses. Most are far from the earth. The closest star is our sun. It provides us with light and heat. Stars have different colors, sizes, and temperatures. The brightness of each star is determined by its size, temperature and distanced from earth. Stars seem to twinkle in the sky because of earth’s atmosphere. We group stars together into pictures called constellations. 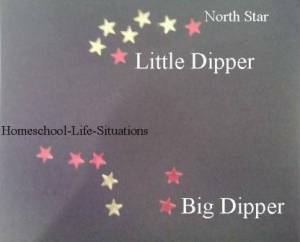 The Big and Little Dipper are two of the best know constellations. The Litter Dipper is also called the Little Bear. The Little Dipper contains the North Star. The Big Dipper is part of a larger constellation called the Big Bear. The two stars that make up the cup of the dipper point to the North Star. There are many other constellations in the night sky. Obtain a guide of the night sky and try to find other constellations. We had a Celestial Seeker for several years. The device illuminates constellation cards. It is nice because the light is not overpowering and you can use it while observing the night sky. When you are observing the night sky you might also see a “shooting star”. They are really not stars but meteor. Have your children make constellations. On a black piece of paper, place stars in a constellation shape. You can have them use white crayon to outline the constellation. Older students can study Vincent Van Gogh. Make sure that they see the picture Starry, Starry Night. They could also try to make a similar painting. Music can make a homeschool unit on the stars fun. Have your children listen to Don McClean's Starry, Starry Night. Listen to the Christmas carols We Three Kings and O Little Town of Bethlehem. Look in hymn books and online for other songs that have "star" in the lyrics. Our homeschool unit on stars has developed an interest in astronomy in my daughter.